As of this day, it is officially summer!!! All of the lame times I’ve had at Scottsdale Preparatory Academy are finally over. To be honest, this day is starting to be magical. Knowing that I don’t have to worry about doing my homework or studying for tests is just a magical feeling. As of this day, I can start my truthful adventures and share with you guys. I have a feeling that this summer will rock! Just to leak to you, I will be going to Costa Rica and Minnesota!!! I’m kind of hoping to be posting daily about all of my adventures I have over the course of the summer. As you can probably see, I’m currently really happy at the moment. As of right now, OUR ADVENTURE BEGINS!!!! Today at 9:00am, we went to get our Caviler King Charles Spaniel at http://hurricanedogs.com . We got past the guard dog “monkey” (small Yorkie). Then we went inside and got greeted by Donna Ehmann. We went over to a table where we talked about things you need to know to take care of your dog. She brought over little Caesar, and we held him in our arms. It turns out he loves eating grass and likes to sleep in corners. We said bye and got him in the crate. We took him for a ride back home and he slept for a few hours. Then he got up and played with us; he loves the red dog plushie. They sleep a lot, and play too. I can’t believe I actually got a dog, after like 100000 times of rejection. So, I am really happy. If you are looking for a breeder in Arizona, then I recommend you go to (http://hurricanedogs.com) and maybe consider buying a puppy. 2 weeks ago I went to San Francisco and I had a great time! The hotel was great! We walked from the hotel to the bay and we saw Alcatraz, we also took a water taxi around Alcatraz. 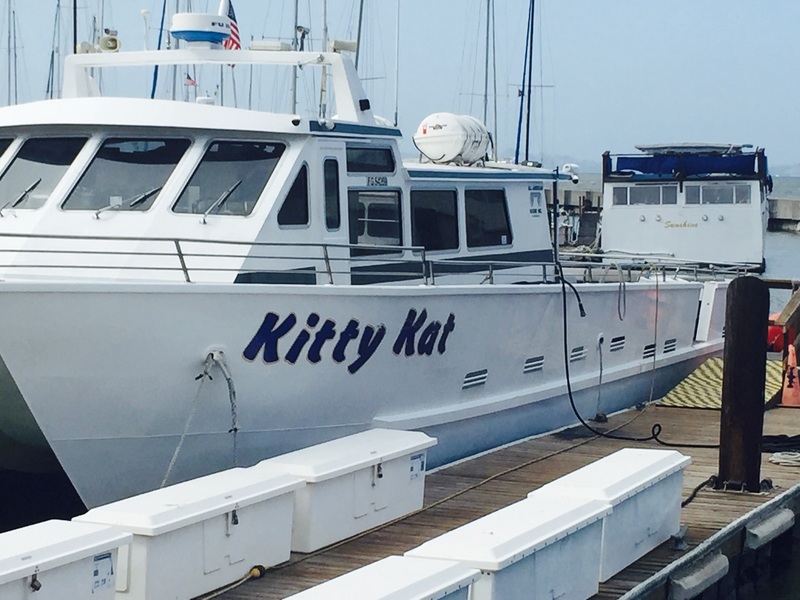 We also saw a cool ship called “Kitty kat”. 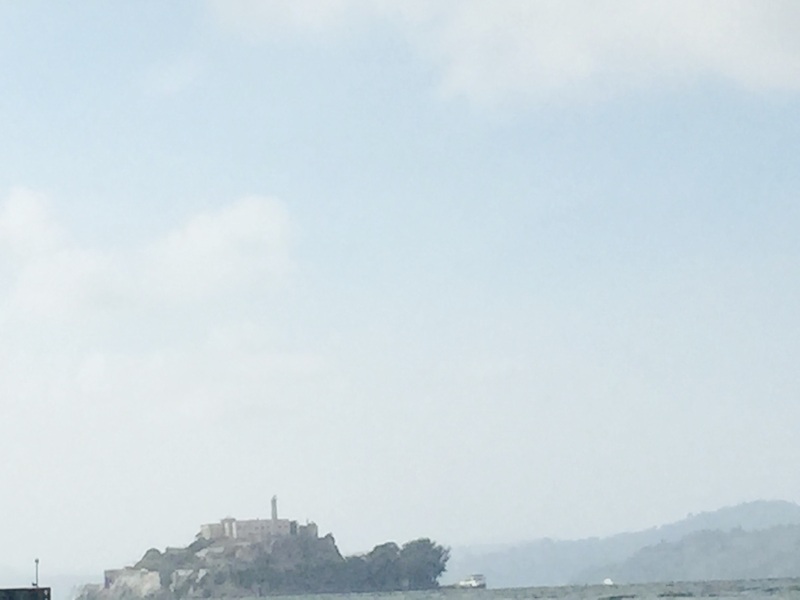 We got really bad pictures of Alcatraz because my dad failed to get his phone out when we went around it! When we were close to the bay Chase drove the boat! 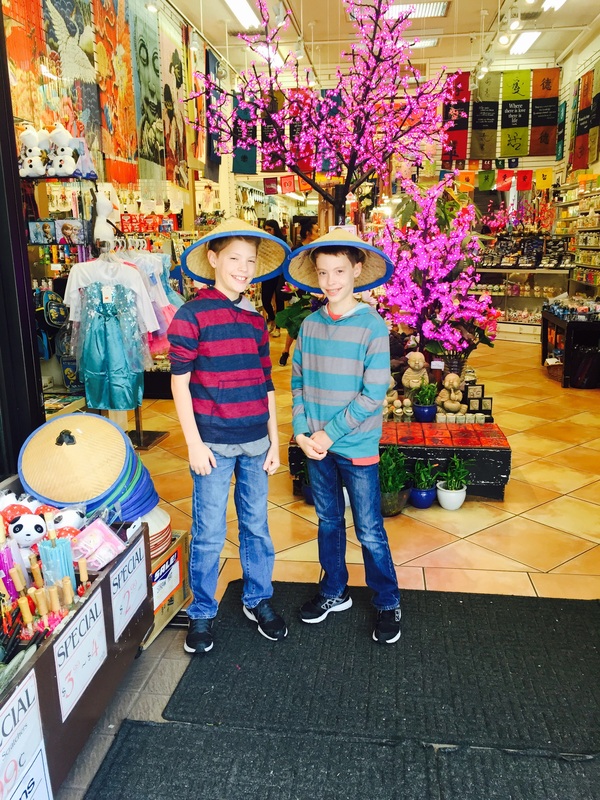 We also went to China-Town. 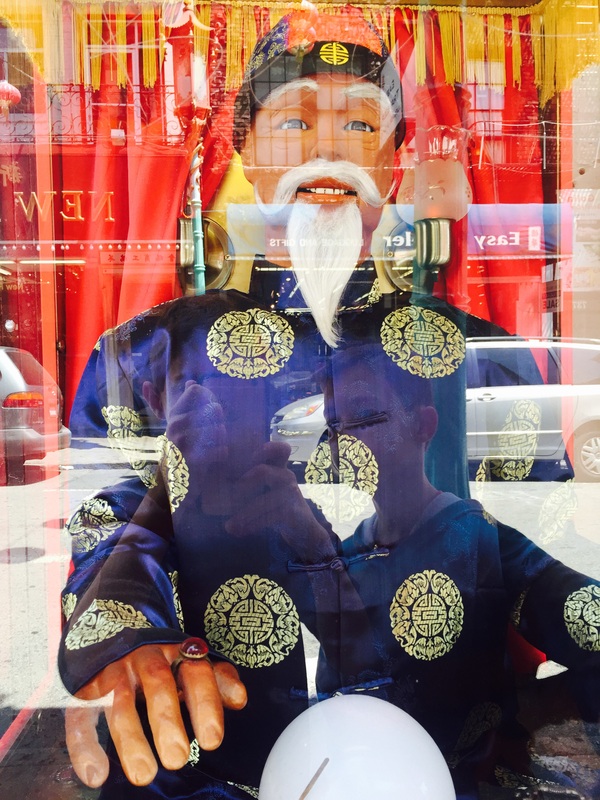 We saw lots of cool stuff even one of the fortune tellers. After we started walking out of China-Town we got lost and we walked like 7 miles that day! I had a blast but next time I want to go to San Mateo and go to the Roblox Headquarters! 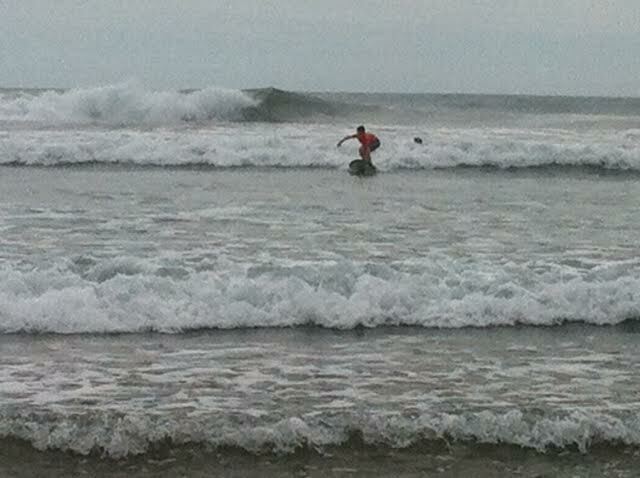 When I was In Costa Rica, I decided to take surfing lessons with chase. 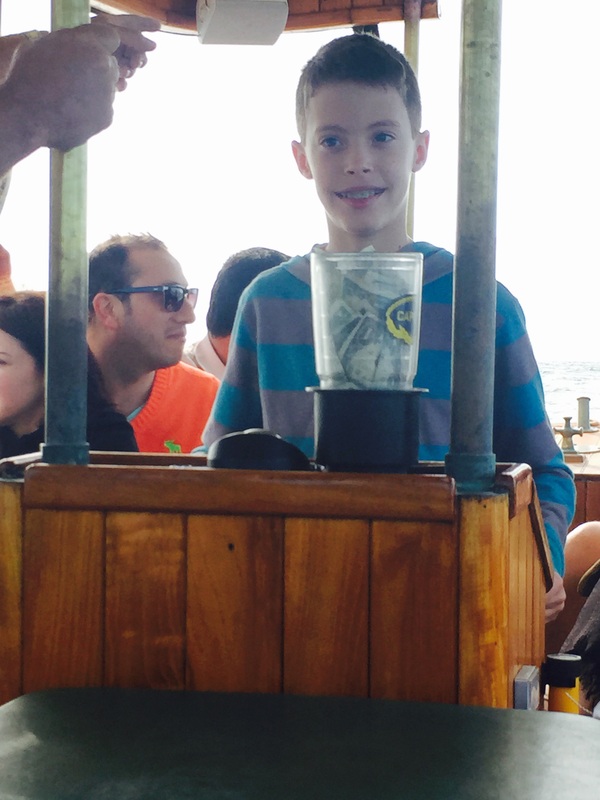 We took lessons at Coconut Harry’s with a instructor named José, he was the best instructor ever! I had a hard time at first but then I got better! It was such a cool experience to get up on the board and fee like you are floating but sometimes I would get wiped-out because some of the waver were very strong! 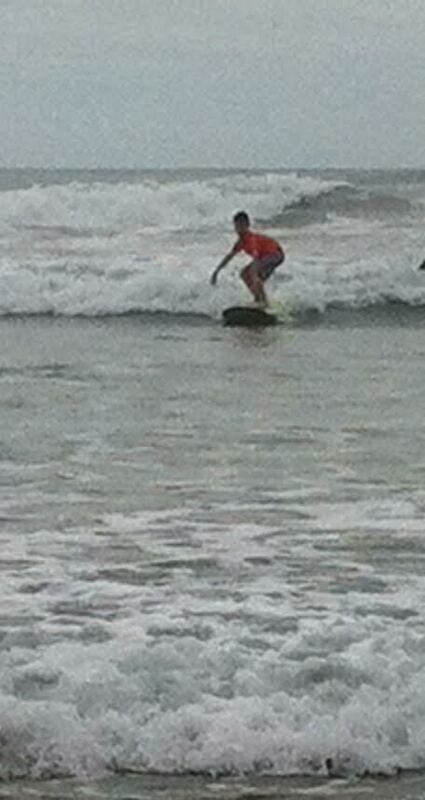 Every time we tried boards that are smaller or bigger!I had lots of fun surfing! The waves in the pictures don’t look big but they really are! 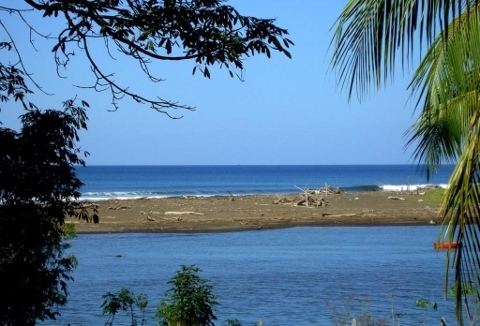 If you want to surf in Nosara, Costa Rica, then go to Coconut Harry’s. When I was in Costa Rica I went to Monte-Verde, which means (Green-Mountain). My family and I went on a tour called, “The Night Hike“, I had lots of fun! First the tour guide walked around and showed us walking-sticks and caterpillars and also lots of beetles! We got to see a sloth but it was very hard to see because it was in a tree and it was very dark. The sloth looked like a small yeti! Oh, I forgot to tell you that we did not take pictures because it was very dark and rainy. There actually were no mosquitoes, that was good even though I don’t get bit for some reason! After the sloth we went out behind the gates looking for a snake and we saw a green one hanging on the tree, It was cool because on television I’ve seen shows that have green snakes! I was kind of scared but not that much. The second tour was called the ” Don Juan, Coffee Tour“, now this one is a long one! Of course the tour was in the rain but not that hard of a rain! I’ll walk you through to process! 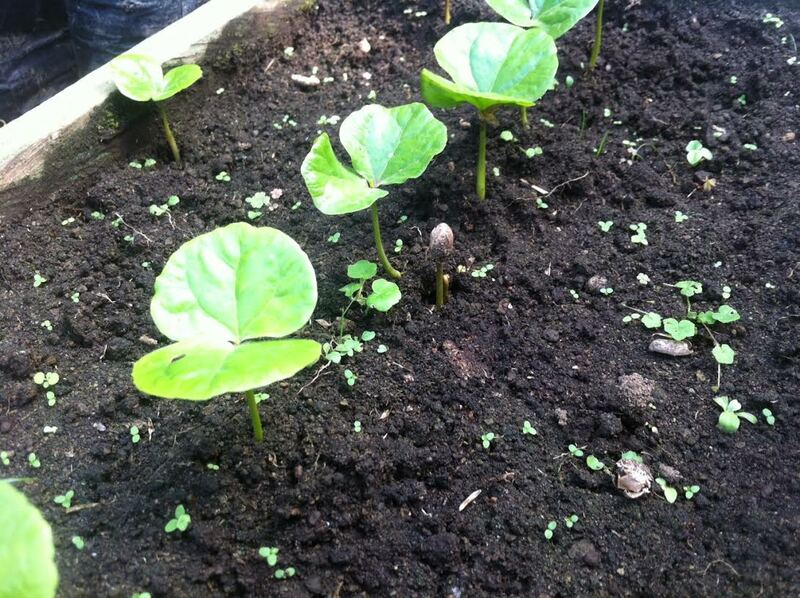 First we went to a green-house with plants and most of all a coffee plant! It takes about 1 to 2 years to grow them! Next we went to a room and the tour guide showed us how they carried buckets and then they picked the red berries off the trees! The workers pick about 15 buckets of berries a day! The baskets are pretty big. That’s hard work! Then we went to another room where we looked on the ground and there were all of these non – peeled berries! Well you had to let the berries sit in the sun of course! So we looked and peeled some! Next we went to to a room with a sorting machine and we watched the machine sort them! It works by shaking the bottom! The really light berries shoot out and the heavy berries go in one bag and the medium go in another and the light ones go in another! Then we went over to a table with a screen built into it and we shook the berries and the dirt from the berries go on the ground. Then we crushed the berries in a large bowl. Next we went into a big room where there was a coffee berry roaster and the machine roasted the berries for 21 – 22 minutes! If you do it longer they will start on fire! There was a chart with the top 10 coffee consuming countries! So ya, then we went to a outside room and me and Chase grind-ed sugar canes in a grinding machine! 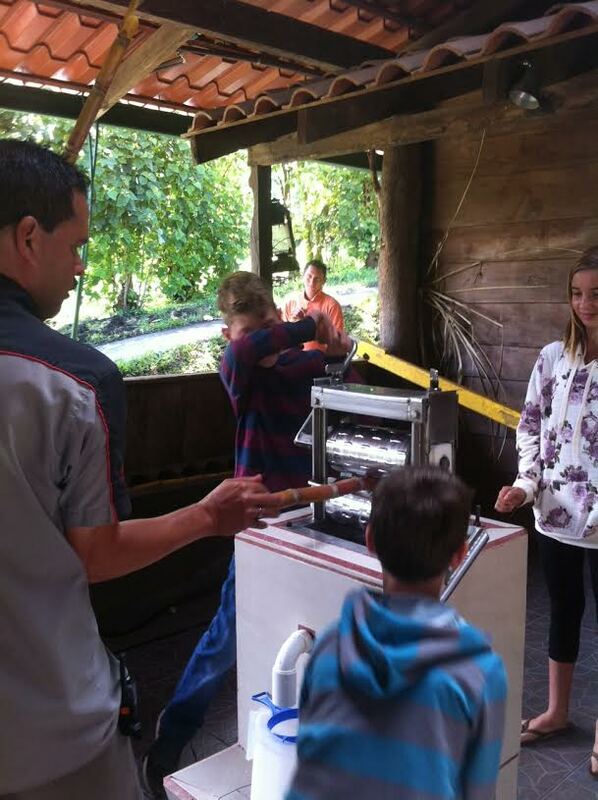 We turned the handles on each side and it squashed the sugar cane, it was very hard! 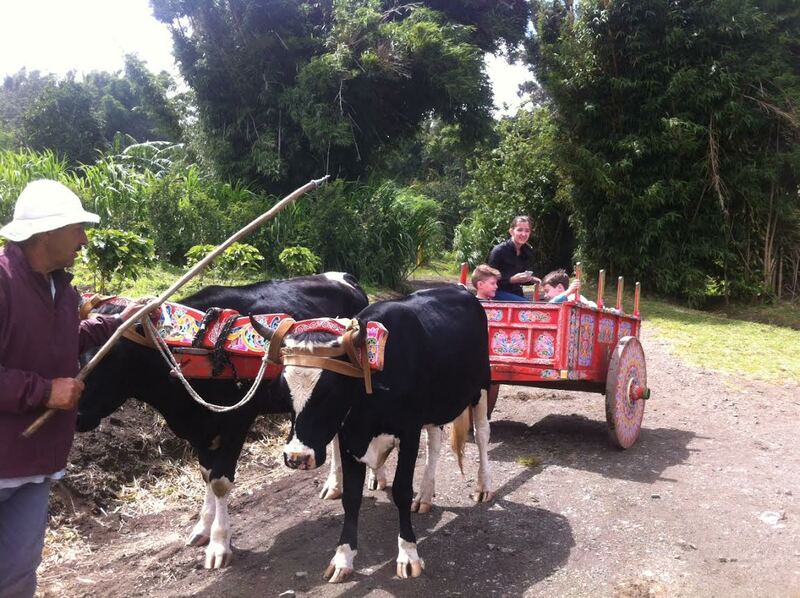 Then we finally got on a wheel barrel and the oxen carried us to the front! That was the end of the coffee tour I learned a lot and I also like coffee now! All day it was sunny but my mom kept saying there was an 80% chance of rain. We didn’t believe her. We had a good day, went to the beach, swam in the pool, had a good dinner that my dad made, played Uno and went to our rooms to watch movies! About 10 minutes later we heard the sound of rain on the tin roof. We thought “oh that’s not that bad”, then BOOM!! 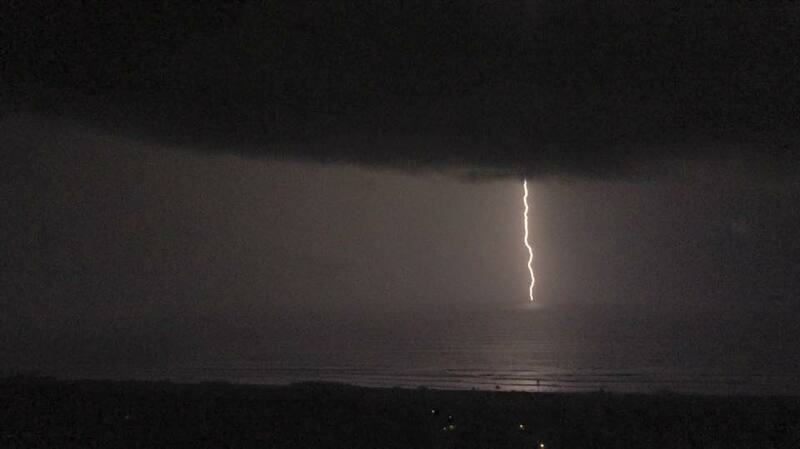 all this rain started pouring down and there was 5 lightning strikes per second!!! Also if you did not know 15 seconds after a lightning strike comes thunder! So it was LOUD! The curtain was blowing and all you could see was blinding light out side the window! I was so scared! Then the thunder stopped and I thought “I think it is going away!”, but no!!! BBBOOOOMMM!!!! All of this thunder came down from the sky and I had to get to a different bed because my bed was close to the window! But after a while, like 3 hours it stopped and we all went to sleep but there was still some rain! The next morning I woke up to go eat breakfast and can you even believe it the sidewalk and ground was covered in leaves, all the furniture was wet and so was the floor of the terrace. It was a real mess, but the sun was shining again. 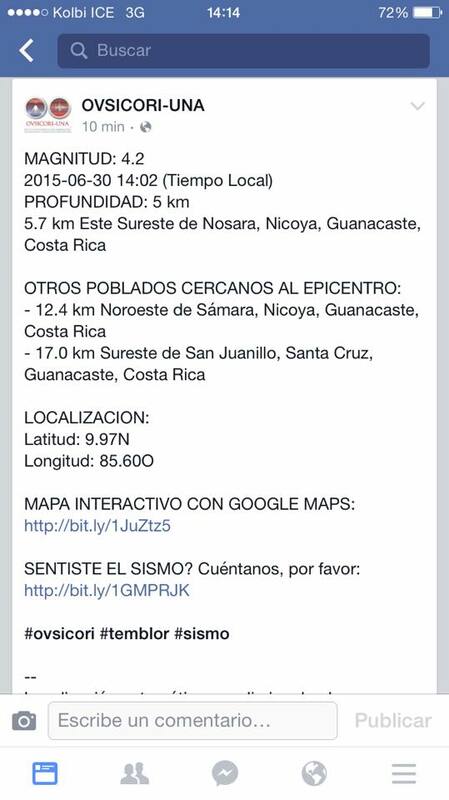 That was the worst storm ever that I’ve experienced in Costa Rica! Yesterday I went to the Boca (means river mouth), with my dad and grandma searching for drift wood. We actually found some good pieces! We all thought, “We should cross that river to get more driftwood”, because there was a lot of drift wood on the beach! We found a perfect spot to cross and it was very hard because the river was pitch black and we could not see a thing! So, we each got a long stick and put the stick ahead of us so we would not fall into a hole! When we got to the middle of the river it started to get deep so we got a little bit wet! Then we went further and there were all of these slippery mossy rocks and my dad slipped and fell in dunking his new iPhone 6 in the water.He managed to get back up but he had to go back! Grandma and I were kind of committed to cross because we were almost on the other side! Once we got there, we looked around and picked up some drift wood – but not that much, we were bummed because there weren’t that many good pieces. Then…we both asked ourselves, “How are we going to get back to the other side??”. We looked and looked for a spot to cross, and we saw a fisherman cross but the water came up to his armpits so we couldn’t go there. Instead we just went the same way back and I’ve got to admit it was very scary but I focused on going slow and made it – even though I got wet!! When we got back, my dad’s phone was like a piece of burning coal, It was super hot!, I thought it was going to explode but It didn’t. 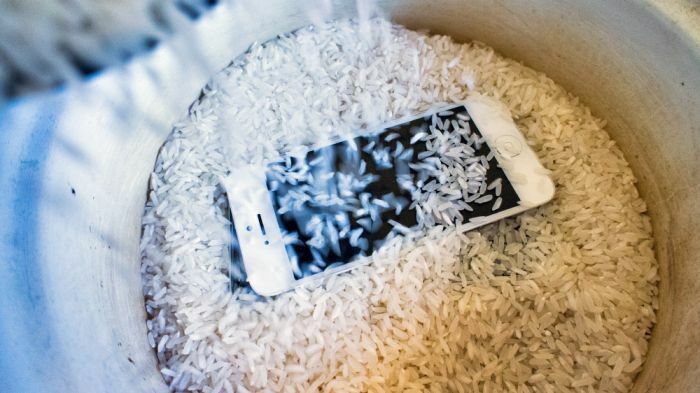 When we got back to the hotel we put it in dry rice and it did cool it off. However, it doesn’t turn on anymore. It is gone forever. Good thing my mom didn’t cancel the insurance on it! So that’s my whole story of how my dad’s Iphone died! Today there was an Earthquake and I was just sitting on the bed and the whole room started shaking, It was the first time I’ve ever felt an Earthquake because In Arizona the Earthquakes are so little you can’t even feel them! So I’ve decided to interview my family because I was in a different room then them! Question #1 – Did you feel the Earthquake? Question #2 – Was it scary? Mom: No…Dad: It was very strange! Question #3 – What did you think? Dad: I did not know it was an Earthquake! What would you do in Earthquake? 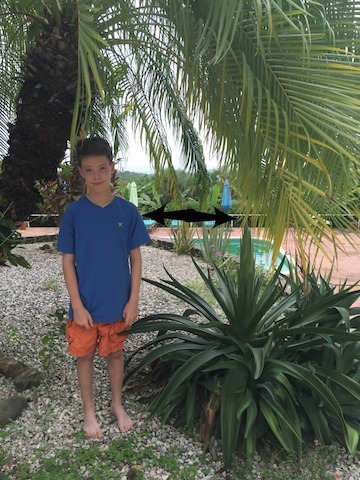 I’m here in Nosara, Costa Rica and this morning we saw that the Century Plant started blooming because of all of the rain last night! We did some research and it said that the Century plant blooms once in it’s lifetime with a stalk that can grow as much as 15 to 20 feet high! We are going to see how fast it is going to shoot up! Chase is going to be the measuring guy so we can see how tall it is! Check out the arrow that shows how high it is today. To see the picture close up just click on it. Today I’m going to COSTA RICA!, I’m so, so excited to go and have an adventure! Every time I’ve gone to Costa Rica I always have had a BLAST! I’m so excited to see Kaiya, Noche and lluvia! I also want to go to the beach and collect sea glass! Dan and Bernie Kamin… on Valentines Day!! !